MONTREAL - Francois Legault's Coalition Avenir Québec officially absorbed the Action démocratique du Québec on Sunday, garnering the support of 70 per cent of Adequistes in a move that unites the province's two centre-right parties. "It's good for us, it's good for the coalition, but most of all it's good for the province of Quebec," said outgoing ADQ leader Gérard Deltell. "We will present Quebecers with a concrete alternative to the Liberals." With the merger plans announced in December, four ADQ MNA's will now join five Caquistes in Quebec City. 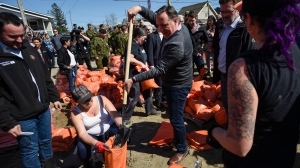 The party, led by former Parti Quebecois cabinet minister Francois Legault, now holds nine seats despite not having taken part in an election. With only 54 per cent of ADQ members mailing-in their ballots for the vote on the merger, discontent had been brewing in the now dissolved party. With only 2,521 members left, the ADQ's rolls collapsed soon after the party's brief stint in 2007 as the official opposition. Despite the Coalition's newly expanded base, Concordia Political Science professor Harold Chorney didn't think that the folding of the ADQ would do much to boost Legault's party. "It's a tiny institution," said Chorney. "It's not like 100,000 members voted to join the CAQ. That would be a much bigger story,"
Parti Quebecois leader Pauline Marois also wasn't too worried about Quebec's new third party. "One thing I am sure of is that Mr. Legault is not prepared to lead the government," said Marois. "He has no ideas." With the CAQ promising to put aside sovereignty questions for a decade, the upstart party has been attacked by Liberals for not abandoning sovereignty outright. While Premier Jean Charest could wait until December 2013 before facing Legault at the ballot box, polls indicate that Quebecers seem more forgiving of the CAQ. In a poll released by Leger Marketing on Jan. 11, the CAQ won the support of 33 per cent of Quebecers, lower than the party has received over the past several months, but enough to win a minority government. While Legault will announce the new party's leadership next week, he confirmed that Deltell will be the Coalition's parliamentary leader.